Most people know about the dangers asbestos and mold pose to health, but how about that underground storage tank? Many homes and businesses have underground storage tanks and if they’re not properly maintained and controlled, they can leak dangerous contaminants into the soil, water, and building. This blog article is part of our Contamination Concerns series, and today, of course, we’re honing in one a lesser-known potential source of serious environmental trouble – underground storage tanks. 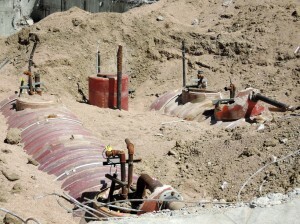 Underground storage tanks are heavily regulated by the federal and state of California governments. Not sure how to ensure your underground storage tank stays compliment? No need to worry – just call the experts at H2 Environmental Consulting Services and we’ll be happy to ensure your tank is always compliant. We can be easily reached by calling (800) 524-3578 or emailing CustomerService@H2Env.com. Let us handle all your underground storage tank needs including regulation compliance, registration and management tasks, and cleanup of all leaks. Let us prepare the permits for your USTs, handling all remedial action, and eventually, closure of your underground storage tank. We’re here to take care of all your UST needs so you can focus on other pressing matters. Why do I need specialize assistance with my UST? There are over half a million USTs in the USA, many of which store potentially hazardous materials such as gasoline, kerosene, heating oil, or others. Government regulations require owners and operators to follow regulations to protect USTs from corrosion, overfills, and spills to ensure they don’t contaminate groundwater or any other material. Installation and certification must be provided by certified contractors, such as H2 Environmental Consulting Services, to ensure all regulations are met successfully. Count on H2 Environmental Consulting Services for all you UST needs. We can provide information and complete remediation services to all companies that own and operate USTs. We can even train your employees on proper procedures for handling USTs to prevent contamination. We have the expertise, manpower, and knowledge to execute all your UST tasks perfectly. Think of us for all your environmental management and remediation needs! We specialize in complete removal and remediation services for mold, fungus, lead, asbestos, and more. If you’ve ever wondered whether your residential or commercial building contained dangerous contaminants, now is the time to find out. Schedule your environmental evaluation now by calling H2 Environmental Consulting Services at (800) 524-3578 today. Using the most modern technology and advanced techniques, we’ll evaluate every molecule of your property to determine whether contaminants are present. If so, we’ll come up with a thorough plan to thoroughly remove and safely dispose of them. Let’s get started! Give us a call at (800) 524-3578 to speak with one of our helpful representatives.